So much truck news going on this year and next year. I've already driven and towed with the 2019 Ram 1500. I've had the 2018 Ford F150 diesel for over a week, we'll cover that in this review. Next month I'll be in Wyoming driving the 2019 Silverado 1500 and at the end of August, in Canada driving the 2019 GMC Sierra. First though, I've reviewed trailer tires and now truck tires. Cooper sent me the all-terrain Discoverer A/T3. I call it the no tariff tire because Cooper is one of the two tire companies headquartered and built in the U.S.
Cooper has been around since 1914. This is a long-term review, so I'll report back on how the tires do in mud and snow and how well the five-rib-deep wide channel cleans out and gives traction. Also, I want to know how long they last. The ribs have grooves on the outside and of course sipes. The new 2018 Ford F150 diesel has some surprising RPM and tow/haul mode characteristics I haven't seen in a diesel. In the Ford Super Duties with 6.7L diesel in tow/haul mode, braking or towing downhill will downshift the transmission to slow you down. The diesels will only downshift if there is enough RPM band left to not go over redline around 3500 RPM. GM Duramax diesel will defuel and go up to 4000 RPM's with downshifting in tow/haul mode. Ford Super Duty and GM Heavy Duty diesels in the last couple of years will even continue to slow down after downshifting. To protect the engines, if there isn't enough RPM band to downshift, will upshift to lower the RPM's to a safe range. This of course means you have to use your brakes to slow down until the transmission can safety downshift. The new F150 diesels are programmed differently. 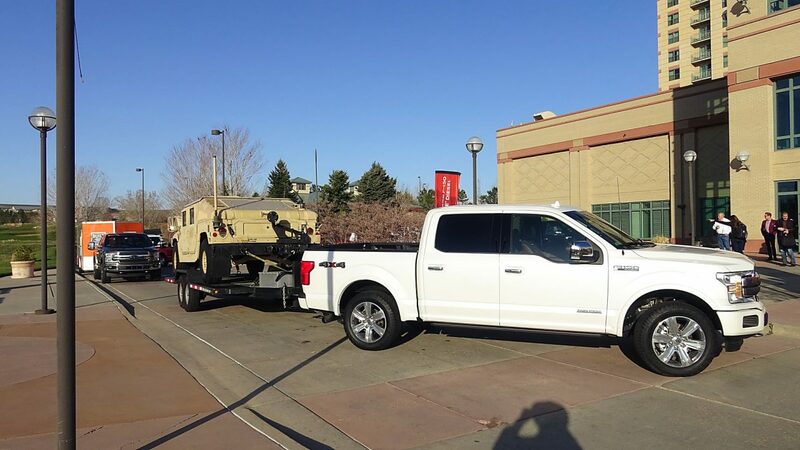 When I helped TFLtruck test the truck on I-70 towing a trailer weighing 8,700 pounds at 11,000 feet from the tunnels to 8,000 feet near Dillon in tow/haul mode going down hill, the F150 when I braked, downshifted twice getting the RPM's up to 4,500 RPM's. That worried me as the engine was spinning that fast. Talked to Ford and they said that was no problem, it was designed for that. So now I have to get used to grade shifting twice when braking with a load. They didn't tell us that at the media launch earlier this year. I guess with no fuel coming in, it's just an air pump. I think Fords' strategy is to hold high RPM's while grade shifting to slow you down without an exhaust brake. I would prefer an exhaust brake. But in light-duty trucks, it's not common to have exhaust brakes such as Titan XD with the 5.0L V-8 Cummins diesel, Ram 1500 Eco Diesel 3.0L V-6. But ironically the GM midsize Colorado and Canyon with diesels, do have an exhaust brake. I've decided I need to think about the new light-duty diesels differently than the heavy-duty diesels. When you get in a Ford F250 Power Stroke, or a GM 2500 Duramax or a Ram 2500 Cummins empty, they are race cars. Loaded they are still remarkable. When you get in a half-ton or mid-size diesel, they accelerate OK empty but with a full load, are not remarkable. Looks like the goal is 30 MPG and not speed in the light-duty diesel segment.